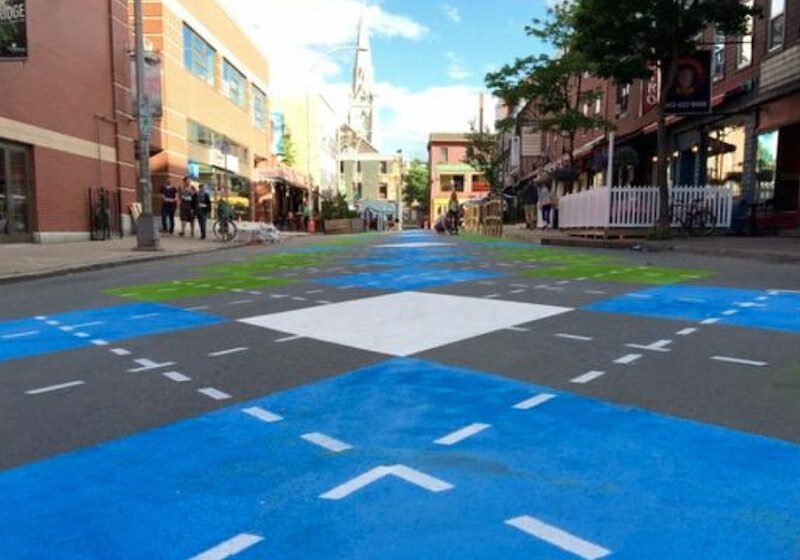 In what is believed to be a World first, city leaders in Halifax, Nova Scotia, have gone ahead and painted the town in a blue Argyle check. Argyle Street is a popular entertainment destination and has recently been spruced-up with the blue and white design, made popular by ‘Pringle’ knitwear and golfers around the World. Argyle Street will host the first annual Argyle Street Festival will happen September 11 and 12, 2015, featuring family entertainment, a live marketplace, delicious local food and drink, East Coast music and more. The argyle pattern is derived from the tartan of the Clan Campbell of Argyll. Argyle knitwear became fashionable in Great Britain and then the USA after the first world war. Pringle of Scotland popularised the design, helped by its identification with the Duke of Windsor, who wore the pattern for jerseys and for the long socks needed for the plus-four trouser fashion of the day.